Choose the Windows printer via spoolss option in the Type: field, and the Generic PostScript Printer option in the Use: field. 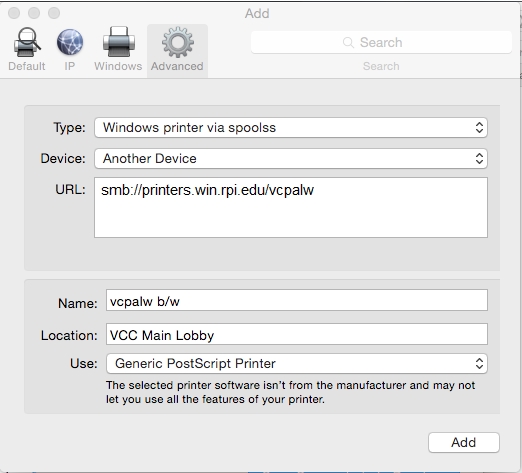 In the URL: field, type smb://printers.win.rpi.edu/printer_name , where printer_name is the printer you would like to set up. In the Name: field, type the name under which you would like the printer to display. Note: When you print something, you should be prompted for your username and password; enter your the RCS userID and password. (No win\ needed.) If you are not prompted for a username and password, an outdated copy is likely stored in your keychain. Delete the old key from keychain access (located in the Applications Utilities folder), and you will be prompted for your login when you next print.